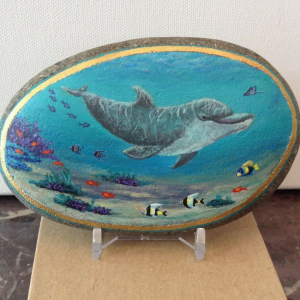 The Pamela Isdell-Fox Rock Painting Artist Interview came about because I was looking for rocks to purchase for the monthly rock giveaway on this site. There was the most adorable sea otter rock that had a “Buy it Now” price and I knew it was the rock I would giveaway in July. 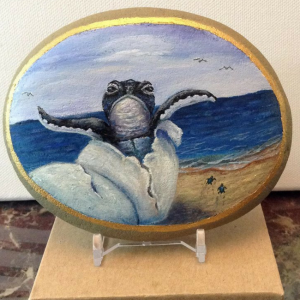 The details on Pamela’s rocks are amazing and I love how she captures the tranquility and beauty of these amazing creatures. 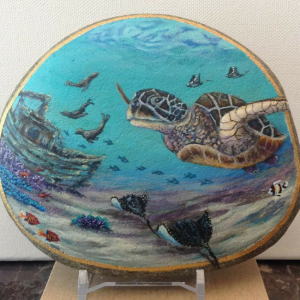 I couldn’t wait to find out how she got started rock painting and learn a few of her secrets. Secrets of course, that I pass along to my readers. Pamela was gracious enough to answer all my questions so you could meet the artist behind the the magnificent stones she creates. Please tell us a little bit about yourself and the art you create. I am a married mom of 5 kids. I had my first child at 40… a second child at 42 and then adopted three girls (siblings) from foster care at the age of 44. The girls were 8, 10, and 12. They are now grown, and I have just my two birth kids at home. I certainly jumped into that.. didn’t I? All great kids… there were some bumps in the road that were expected with the circumstances my three adopted daughters had been living in before adoption. I have worked as a hairdresser (licensed by 17), a M60 machine gun specialist and small arms marksmen in the Air Force, a floral designer, nurses aide and last 25 years as a Registered Nurse with advanced certification in critical care medicine, and an artist. We moved to the coast of Washington almost two years ago from hot Sacramento, CA. I decided to focus on my artwork here as I had an injury and arthritis that prevents me from returning to nursing… and because the cost of living is so much less here don’t have to earn big bucks just to make a mortgage…and because I just wanted to. My artwork is currently being displayed in Hoquiam and Aberdeen at area galleries. 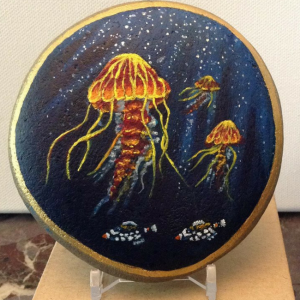 I have a sea life painting at the Grays Harbor Healing Gallery at our community hospital. My major in college was in nursing, but I had always wanted to be an artist, antiquities dealer, a museum curator, or paleontologist. I started rock painting five years ago before it was popular. I literally fell over absolutely nothing and ruptured tendons and broke a bone in my leg which become chronic and I found myself unable to work.. awful fall over nothing. I decided to start painting again. I had painted a couple decades earlier (or so.. let’s just leave it at a couple decades) in oil paints with Bob Ross on PBS. I would tape his shows and paint with him. With college and career, artwork took a back burner. Soooo… with this injury, I had oodles of time on my hand to paint. I found oil paints and supplies had become very expensive…. so being broke the best and affordable canvas I could get was rocks… I have always loved rocks and minerals and had a great collection which included many fossils as well. I’m a bit rock obsessed. My large brood of children would search out the smoothest rocks they could find for me to paint on. There were no resources to at that time because rock painting wasn’t popular. I learned through trial and error what worked best. I used the inexpensive acrylic paints from our local Walmart and painted away. It surprised me what I could do with craft acrylic paint. Acrylics were very different from oil painting in drying and blending times. But, it did save me…I had something to do. I did take some rocks to a craft sale once, and people either loved them or didn’t understand the value. It was a rock… not a painting to some people. 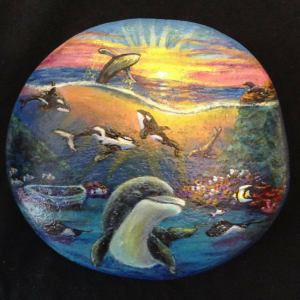 Sometimes it took me 24 hours to complete a rock painting. I always strived for a fine art look and feel. 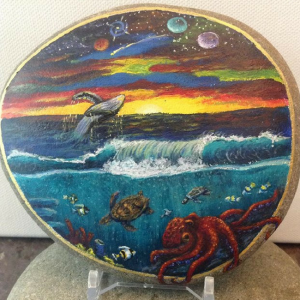 Some people thought a painting that took 24 hours on a rock should cost $10… but others could see the value and the time and experience in them. When we moved here to Washington, I found the people here loved painting and hiding rocks. Since then, the rock movement has really taken off. I love sea life and wildlife art. I enjoy many well-known and many not-so-known artists. When I first started back to painting, I followed and artist Wyland.. he does sea life and conservation. I really admire a person who tries to change the world for humans and animals. Our family would travel to Carmel and go to his gallery receptions when he had them. He’s just an all-around nice guy who cares about the planet. He never runs out of ideas or inspiration for his next art piece. My favorite Wildlife artist is Val Warner from Placerville CA. She is photo realistic and does amazing work and compositions. Inspiration comes from the sea and harbor and the woods. 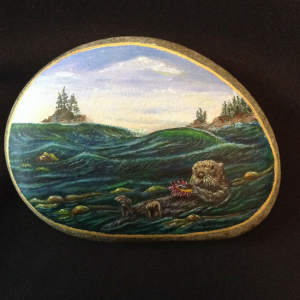 I painted a sea otter recently on a rock. 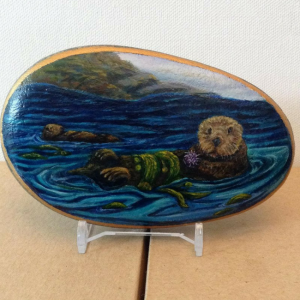 It was painted right after the sea otter in the giveaway (and thank you!). I wanted a more photorealistic otter… and I did achieve it. The sea otter is one of my favorite sea animals. I love watching them play in the kelp forests of Monterey, CA. I do hear they will tear you up if you approach to close though. So my favorite rocks are the sea otters and a Northwest orca painting I love that has lots of coral and detail. I jump project to project on rock, but I am usually working on other surfaces at the same time. I have artist tables I create and work with driftwood, sand dollars, and other shells. When you start a new series of rocks, do you sketch out the designs on paper or do you begin immediately on the stones? I usually sketch to paper first if the piece has more than one area or is very detailed. A painting that’s above and below the water, I would typically sketch to paper first then on the rock. Other more simple designs I sketch on the rock first. But one way or another a sketch is done. Here in Washington along the coast, there are a few beaches with very smooth tumbled stones of all sizes and they tend to be pretty flat as well which is great because they present as a canvas in a stand. The beaches are up near the Quinault and Queets Rain Forests. The beaches are marked as Beach 1,2,3,4. We find a beach we call 2.5… it is between beach 2 and 3 (duh) unmarked and easier to make way down to the rocks. I believe beach 2 and 3 have a lot of smooth stones as well. Is there a particular brand of paint you like to use? Why is it your favorite? I like using the Atelier Interactive brand...they are artist acrylics that can be re-wetted and re-blended. The color pigments are also very nice and colorful. I make a spray in a fine mister that is one part alcohol (isopropyl alcohol not the good alcohol) and nine parts water. I use it to mist my acrylic paints to keep a nice moist ungummy acrylic paint…it prevents the skin from forming on the acrylic paint. I use it only with Atelier Interactives though.. I know it works on them. I have to say I also love aluminum foil because it seals over my paint palette and keeps my paints from losing moisture. I use wax paper as an extra palette area for mixing or blending. Also a very good #1 paintbrush for details. Pretty simple .. but important. Is there a special tool you can’t live without? If so, why? My fine mister, it keeps acrylics from drying out or becoming gummy. It’s important to me. 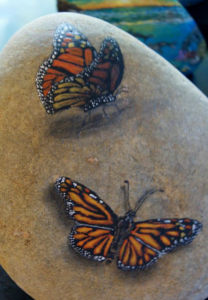 I have painted several 3D butterfly rocks and hid them in our town and beaches. I find that the adults in my area watch for my rocks and they race to find them when I put them out. I would rather a kid find them. The adults fight over them… not cool.. I hid one at a bird sanctuary and it got ugly there. So, when I create one I don’t announce it now. I have sent rocks to ill people who need some happiness and love rock art. My goal was always to produce excellent artwork on rocks. I have sold many more rocks than canvases, and they are affordable and allow people without big budgets to own beautiful artwork. I paint what strikes me… what interests me…. sometimes what I know people want. I have to consider the size of the rock as well and shape. Don’t give up… like anything… the more you do it the better you get. Never, ever compare your work to others… I have done that only to find the person I am comparing myself to is an admirer of my work. You will have a style.. go with it and perfect it. The more you practice, the better your artwork gets! Your style is your own.. people will recognize your work by that style. Be you…there’s only one you. Your artwork is a one of a kind. Keeping my chin up when I sell nothing in an auction……:( questioning myself. My maid wakes me up with my coffee and muffin at 10 am… then she draws me a warm bath with lilac and rose petals. I soak while little feet ferries give me a pedicure and the forest birds wrap me in my plush warm towel as I exit the tub. After a hard night”s work, minions have prepared the finest suspensions of paint in the most exotic colors for my use … A herd of unicorns with razor-sharp horns protect my fine paint from thieves from neighboring artist colonies hungry for my secret suspensions…. and then I wake up into my world of chaos and a day dependent on my dependents… ha ha ha.. my days are never the same… I have kids.. I get painting in when they let me and the sun comes out. I do usually get at least 2 hours in a day, however. I have an area with many windows for light in my house. I’m surrounded by hundreds of acres of forest. I try to keep it organized.. depending on what my project is… I use a pretty good-sized table facing out into the woods. I have plastic drawers of supplies. I keep a rolling cabinet with supplies so I can paint in our tv room as well if something is on tv. I am working on rocks… sea life.. a dolphin. I have some driftwood drying out to paint on, and I have a curio heart table I am working on. I’m also gathering driftwood from nearby beaches to make a sculpture. I have a Facebook page called Fox Rocks and Fine Art. I have work on that page and they can message me with inquiries. I sell my work on Original Artwork Bid and Buy, an auction site on Facebook. You can also google me – Pamela Ispell-Fox. I would like to thank Pamela for taking the time to share with us her ideas and techniques. 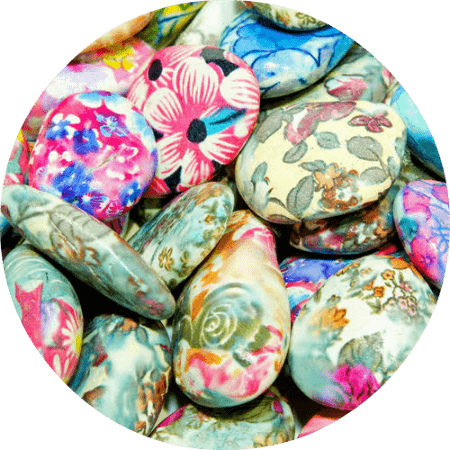 If you want to get started on rock painting – check out the resources below. We’ve reached the end of the Pamela Isdell-Fox Rock Painting Artist Interview. Subscribe to our newsletter to be eligible to win our monthly rock giveaway. Make sure you pin the post below so you can refer back to it again and again. Loved the interview. Loved the otters. Found that auction site a bit confusing and intimidating. must find a way to get a rock otter painting! Awesome paintings!! Never a doubt that you would succeed.